The Laysan Albatross Wisdom, the world’s oldest known wild bird, grooms her chick in February 2018 on Midway Atoll. Photo by B.Peyton/U.S. Fish and Wildlife Service. Want to learn more about birds? Sign up for our newsletter, full of birding tips, news, and more! 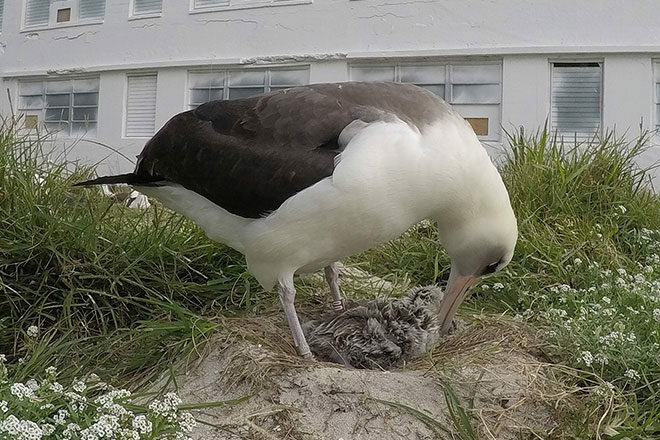 Albatross chicks hatching on Midway Atoll National Wildlife Refuge now have one less hazard to face on their journey to adulthood. The atoll, home to the world’s largest population of Laysan Albatross, has been declared lead-free after a decade-long effort to remove the toxic substance from buildings, sand, and soil. The cleanup has been a high priority for conservationists because of the site’s ecological significance. Set in the Northwestern Hawaiian Islands, Midway Atoll provides essential habitat for millions of seabirds and hosts a huge diversity of species, including tropicbirds, terns, and petrels. The atoll’s three islands are home to Laysan, Black-footed, and Short-tailed Albatrosses. A Laysan named Wisdom, who at 67 is the world’s oldest known wild bird, returns here every year to nest. Midway’s lead contamination was a byproduct of the atoll’s history as an important air and submarine base during World War II. The Battle of Midway in 1942 served as a critical turning point in the war. In 1996, the U.S Navy handed the Midway Islands over to the Department of the Interior for management. The property transfer included 135 buildings, many covered with lead-based paint. Over the years, deteriorating paint landed on the ground and was picked up and eaten by young birds. Lead is highly toxic, and chicks that ate paint developed “droop-wing,” a paralysis that made flight impossible and doomed tens of thousands of young birds to premature deaths. Researchers sampled blood from the chicks and proved definitively that lead paint was the culprit. The U.S. Fish and Wildlife Service and American Bird Conservancy spearheaded the cleanup, made possible with support from Audubon California and by a legal analysis from the Center for Biological Diversity. The cleanup began in 2011. As of 2016, more than 20,000 cubic yards of lead-contaminated soil had been treated and safely disposed of. By the end of 2017, the cleanup was complete. The last of this year’s newly hatched Laysan Albatross chicks will fly out to sea by August. And for the first time in more than 50 years, none will be left behind on Midway because of lead poisoning. A version of this article appeared in the August 2018 issue of BirdWatching magazine. This story was provided by American Bird Conservancy, a 501(c)(3), not-for-profit organization whose mission is to conserve native birds and their habitats throughout the Americas.